A simple molecule in the atmosphere that acts as a “detergent” to breakdown methane and other greenhouse gases has been found to recycle itself to maintain a steady global presence in the face of rising emissions, according to new NASA research. Understanding its role in the atmosphere is critical for determining the lifetime of methane, a powerful contributor to climate change. The hydroxyl (OH) radical, a molecule made up of one hydrogen atom, one oxygen atom with a free (or unpaired) electron is one of the most reactive gases in the atmosphere and regularly breaks down other gases, effectively ending their lifetimes. In this way OH is the main check on the concentration of methane, a potent greenhouse gas that is second only to carbon dioxide in contributing to increasing global temperatures. With the rise of methane emissions into the atmosphere, scientists historically thought that might cause the amount of hydroxyl radicals to be used up on the global scale and, as a result, extend methane’s lifetime, currently estimated to be nine years. However, in addition to looking globally at primary sources of OH and the amount of methane and other gases it breaks down, this new research takes into account secondary OH sources, recycling that happens after OH breaks down methane and reforms in the presence of other gases, which has been observed on regional scales before. Nitrogen oxides are one set of several gases that contribute to recycling OH back into the atmosphere, according to Nicely’s research, published in the Journal of Geophysical Research: Atmospheres. 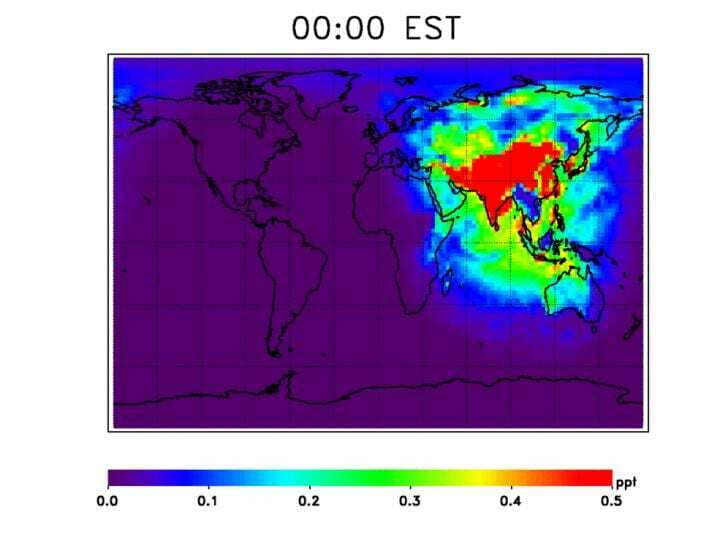 She and her colleagues used a computer model informed by satellite observations of various gases from 1980 to 2015 to simulate the possible sources for OH in the atmosphere. These include reactions with the aforementioned nitrogen oxides, water vapor and ozone. They also tested an unusual potential source of new OH: the enlargement of the tropical regions on Earth. OH in the atmosphere also forms when ultraviolet sunlight reaches the lower atmosphere and reacts with water vapor (H2O) and ozone (O3) to form two OH molecules. Over the tropics, water vapor and ultraviolet sunlight are plentiful. The tropics, which span the region of Earth to either side of the equator, have shown some evidence of widening farther north and south of their current range, possibly due to rising temperatures affecting air circulation patterns. This means that the tropical region primed for creating OH will potentially increase over time, leading to a higher amount of OH in the atmosphere. This tropical widening process is slow, however, expanding only 0.5 to 1 degree in latitude every 10 years. But the small effect may still be important, according to Nicely. She and her team found that, individually, the tropical widening effect and OH recycling through reactions with other gases each comprise a relatively small source of OH, but together they essentially replace the OH used up in the breaking down of methane. “The absence of a trend in global OH is surprising,” said atmospheric chemist Tom Hanisco at Goddard who was not involved in the research. “Most models predict a ‘feedback effect’ between OH and methane. In the reaction of OH with methane, OH is also removed. The increase in NO2 and other sources of OH, such as ozone, cancel out this expected effect.” But since this study looks at the past thirty-five years, it’s not guaranteed that as the atmosphere continues to evolve with global climate change that OH levels will continue to recycle in the same way into the future, he said. Ultimately, Nicely views the results as a way to fine-tune and update the assumptions that are made by researchers and climate modelers who describe and predict how OH and methane interact throughout the atmosphere. “This could add clarification on the question of will methane concentrations continue rising in the future? Or will they level off, or perhaps even decrease? This is a major question regarding future climate that we really don’t know the answer to,” she said. The study used data from NASA’s Total Ozone Mapping Spectrometer instrument, the Ozone Monitoring Instrument aboard NASA’s Aura satellite, the Atmospheric Infrared Sounder aboard NASA’s Aqua satellite, the National Oceanic and Atmospheric Administration Cooperative Global Air Sampling Network, the Modern-Era Retrospective analysis for Research and Applications, Version 2 data set and the Global Model Initiative chemical transport model.